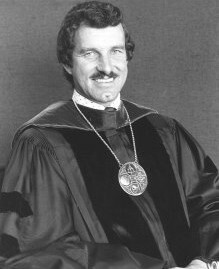 Born in Zeeland, Michigan, Diekema graduated from Calvin College in 1956. He received his M.A. in sociology and anthropology and in 1965 and a Ph.D. in sociology all from Michigan State University (MSU). During graduate school he taught at MSU and worked in housing and later the registrar's office. Next he went to the Medical Center of University of Illinois teaching and moving into administration. Center was built. Anticipating future growth, additional land also was purchased east of the East Beltline. He also oversaw the expansion of the curriculum, from 50 to 75 program majors, including a number of professional programs, the recruitment of faculty, and the improvement of existing programs. All of this occurred during a period of rapidly rising costs, which required extensive fund raising for debt redemption and the establishment of endowments to help offset rising tuition costs. During his tenure, enrollments rose above 4,000 for the first time and had leveled off at just under 4,000 when he retired in 1995. He is married to Doris Jeane Waanders and they have seven children Douglas, David, Dan, Paul, Mark, Maria Diekema-Zuidema, and Tanya.